Pouvez-vous apporter vos chaussures, s'il-vous-plaît? Can you bring your shoes please? Vous avez passé votre examen. Note the similarity of the forms. IMPORTANT: The first letter is determined by the owner (n =our; v =your, l =their) etc. but the rest of the adjective is related to the number of the thing that is possessed. Their memories of yesterday, oh! "Vous avez passé votre examen" according to google translate (and my intiution) means Vous avez passé votre examen. But here it says: "You took your exam". Vous avez eu votre examen is you passed it. In practice, and according to two native speakers I am in touch with, that distinction is lost in practice. I am certain from several French teachers that "passer" is used to mean taking a test. I am told to pass a test in the English sense of pass is "reussir," to succeed. So the French equivalent of "You passed your test" is "Tu as reussi ton examen." (I can't type the accents on the e in reussir). 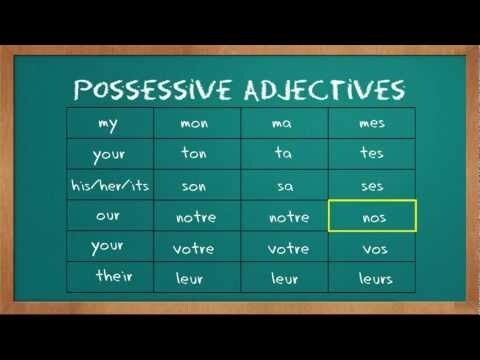 Having read the lesson about using the definite article when referring to parts of the body, why does the idiom for "taking to one's heels" translate as "nous avons pris nos jambes à notre cou"? as in the practice lesson "la main dans le sac" posted on Facebook recently. Merci, ça devient plus clair pour moi maintenant. Is there a liaison, pronouncing, "ils aiment leurs parents?" Bonjour Susan ! Yes, there is one liaison between "ils" and "aiment", as such: [illzM] :) I hope that's helpful! It is - and it leads to another question: are there rules or conventions? I notice differences sometimes between Kwiziq voice files and those on the videos.